KIEV, Ukraine -- Ukraine voted on Sunday for local councils and mayors in an election which should provide the first real clues to President Viktor Yanukovich's standing at home since his election last February. 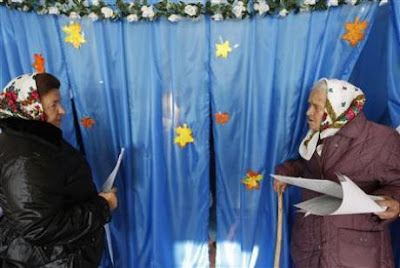 Women leave a voting booth during local elections at a polling station. The Regions Party, backbone of the parliamentary majority supporting Yanukovich, is taking on a host of rival parties for local councils which will be responsible for implementing his economic reform policies. But, in a hark-back to the fraught run-off last February in which Yanukovich beat former prime minister Yulia Tymoshenko, the air was thick with accusations of imminent vote-rigging. Tymoshenko herself, who heads the Fatherland party and remains Yanukovich's bitter foe, said on the eve of the vote: "There is no limit to what these people will do. They will falsify the vote. You can depend on it." Iryna Bekeshkina of the Democratic Initiative political research foundation told Reuters the elections would be the ruling party's first test of democracy. "But the danger these elections represent for democracy is very high," she said. Some opposition parties say thousands of forged ballot papers have turned up in Kharkiv, in eastern Ukraine, as well as in other parts of the country. They also accuse the Regions of exploiting an unfair advantage by using the resources of the ruling administration -- such as official vehicles -- to mobilise voters on their side. "There will be a big temptation for the new authorities to use administrative resources. This is a big danger for future elections," Bekeshkina said. Yanukovich's Regions Party is strong in the highly-populated Russian-speaking east, which forms the president's power base, and in Crimea. Tymoshenko is strong in the Ukrainian-speaking west and centre. Some opinion polls showed that support for the Regions has dipped since Yanukovich took power in the ex-Soviet republic. Commentators say a failure to deliver on campaign pledges, such as improving the local business climate by granting tax breaks to small businesses, has played a part in this. There is also widespread resentment at a big hike in domestic gas prices -- at the insistence of the International Monetary Fund -- and the government's pension reform plans which will raise the retirement age to 65 years for men and women. Tymoshenko's party is not the only one girding for a fight with the Regions Party. The Communists have levelled charges of "dirty tricks" against the Regions. A fierce battle for votes was in prospect in Crimea where the two sides are disputing seats in the peninsula's autonomous parliament. Andriy, a 46-year-old engineer in the Crimean town of Simferopol, complained of high charges for housing utilities, poor roads and decrepit buildings. "I am against the Regions Party wanting to seize power here and put into Crimea a single leading man," he said in a reference to Yanukovich. "They've been in power in Crimea for almost 10 years and the situation is not getting any better." In the eastern city of Donetsk, most voiced support for the Regions. But Tatyana Kozak, a 70-year-old pensioner, expressed nostalgia for the Soviet period and was voting communist. "I worked for 50 years and I get 720 hryvnia ($90 dollars) a month. It would be better with the Communists." In Lviv in western Ukraine, Ivan Baranych, a 54-year-old driver, dismissed the elections as "complete filth" and said he would vote for the fringe nationalist party Svoboda. "I hope it (Svoboda) will be able to defend the national interests of Ukrainians not only in words but also in deeds."